An estimated 60 people came out to hear from state Sen. Ginny Burdick and Rep. Margaret Doherty. 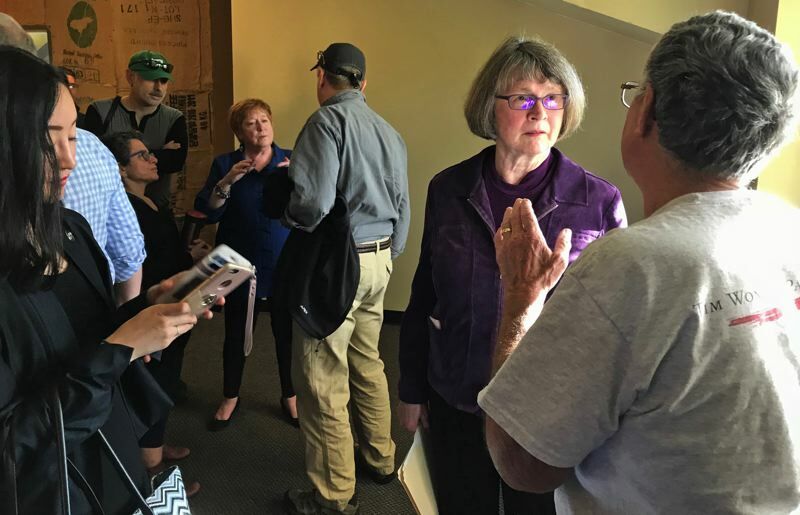 Neither summer-like temperatures nor Halloween preparations were enough to keep an estimated 60 people from pouring into Symposium Coffee in downtown Tigard on Saturday to pepper local lawmakers with political questions. Sen. Ginny Burdick and Rep. Margaret Doherty fielded questions for about an hour, then took several more after the event ended. Both lawmakers represent Tigard, although Burdick's Senate district also extends into Southwest Portland. Burdick leads the Senate Democratic caucus — she referred to herself "chief cat herder." Doherty chairs the House Education Committee. Both survived the chaotic but highly productive 2017 session of the Legislature and are gearing up for the 2018 short session, which begins in February and which is expected to focus mainly on the state budget. Several people came to address the issue of the National Popular Vote, a movement to get states to support whichever candidate wins the outright majority of votes nationwide. It is seen as a work-around for the Electoral College, which swung the 2000 election to George W. Bush and the 2017 election to Donald Trump, despite both men receiving fewer votes than their opponents. Burdick favors the compact but only through a vote of the people, and not by legislative action alone. She chairs the Senate Rules committee and kept the issue going before the full Senate for a vote this spring. She told a restive crowd that the compact has unintended consequences: had the compact been in place in 2004, she said, all of Oregon's presidential electors would have been forced to support President Bush's re-election, even though Sen. John Kerry won the state. 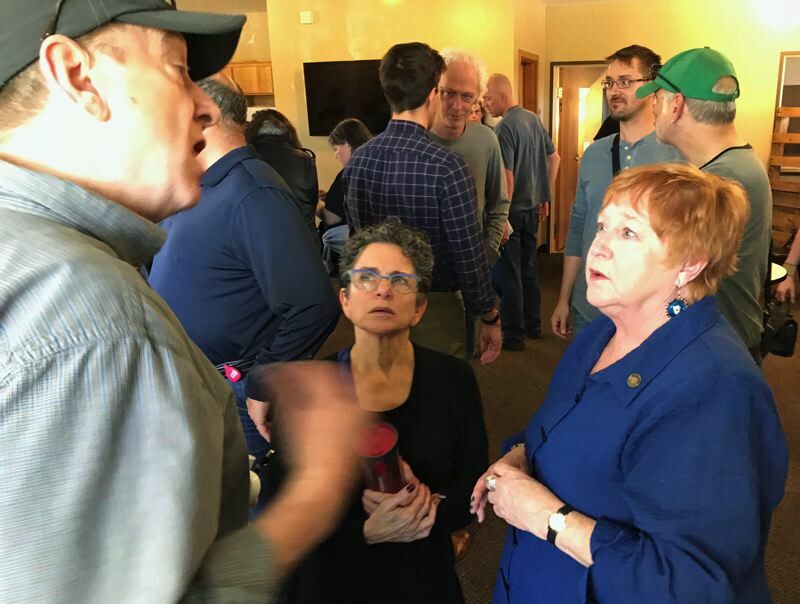 The lawmakers also took a wide variety of questions on affordable housing, rent control, and the urban growth boundary; the imaginary line around Portland and its suburbs, beyond which urban development is not allowed. Other issues ranged from the environment to gun control, and from health care to clean energy bills. Doherty told the crowd that — unlike the partisan logjams of Washington, D.C. — almost all bills in the Oregon Legislature pass with bipartisan support. "That's just how we do it out here," she said. Among the 2017 bills Burdick said she is most proud of: the 10-year transportation package, and a bill enhancing Oregon's status as a so-called "sanctuary state." The status means the state, counties and cities are limited in the ways they can be used as extensions of federal immigration policy. "There are children right here in Tigard who are afraid to go to school, because they're not sure if their families will be there when they get home," Burdick said. "That's just not right."